Be the first to share your favorite memory, photo or story of James. This memorial page is dedicated for family, friends and future generations to celebrate the life of their loved one. 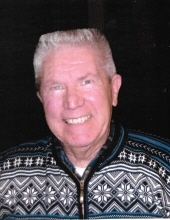 It is with great sadness that the family of James Walter Carlson announces his passing after a recurrence of cancer on Friday, April 12, 2019 at the age of 80 years. James is survived by his wife Mary Ann of 57 years, his children Jim, John (Lynn), Eric (Sarah). James' sense of humor and caring will be missed by his eight grandchildren, April, Arli, Sylvia, Ethan, John, Victoria, Elizabeth and Jace, as well as his two great-grandchildren Leah and Logan. Throughout his life, James enjoyed completing projects around the home using his carpentry skills learned from his father Clare. Upon retirement James and Mary Ann enjoyed traveling around the world eventually visiting all seven continents. Prior to retirement James had a successful career as an executive for Heidelberg USA. He took great pride in the growth and success of his three sons. James passed away at Yavapai Regional Medical Center surrounded by his family. A private memorial service will be held at a later date. In lieu of flowers those who so desire may make a donation in memory of James to the YRMC Foundation. To send flowers or a remembrance gift to the family of James Walter Carlson, please visit our Tribute Store. "Email Address" would like to share the life celebration of James Walter Carlson. Click on the "link" to go to share a favorite memory or leave a condolence message for the family.